Come join others who are enjoying the fad of adult coloring. Participants find it relaxing. This is a fun way to share ideas and time with others who also enjoy coloring. Everyone is welcome whether you enjoy simple pictures to color or very complex ones. You can bring your own supplies or use those the library provides. The library also provides coloring sheets if you do not already have some. The Adult Coloring meeting will be on the third Thursday of the month at 5:30 pm and last until 7 pm. Drop in anytime during those hours. The club is for anyone interested in crocheting. If you are new to crochet, an experience crochet-er, or if you are a rusty crochet-er, you will be welcome. The meetings are scheduled on the 3rd Tuesday of the month from 6 pm to 7 pm during January to May. RIOT ACT is our book club. The name stands for 'Readers In Our Town Are Coming Together'. We meet on the 4th Thursday of the month at 7 pm at the library. This club is for those who enjoy cooking and have adventurous taste buds. Each month we pick a theme. We find a recipe from the AtoZ World Foods link on our main webpage, from a cookbook, or sometimes we open it up to any other kind of source. We let the library know what dish we have chosen to make. Then, we make the dish and bring it to the meeting for everyone to share. 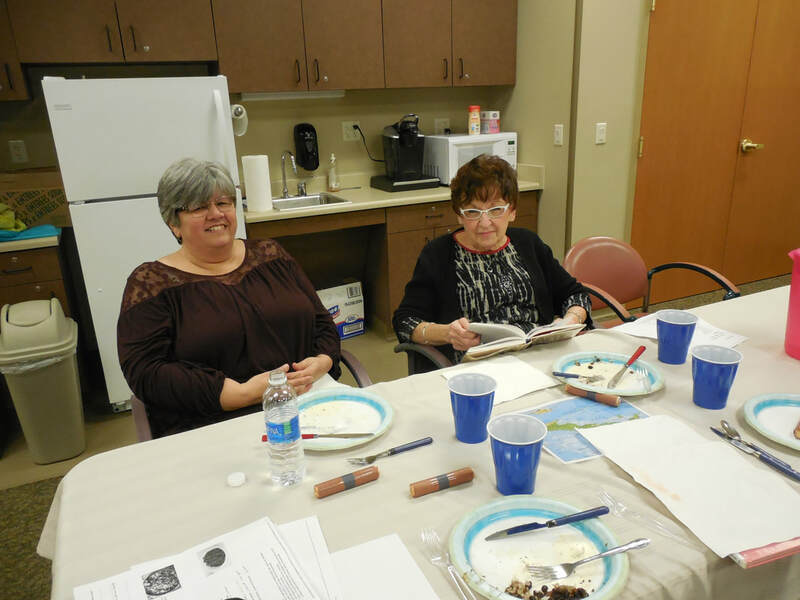 We discuss the recipes we made and we get to know each other a bit better. It is a fun event! February 2018- Food from the book, Abraham Lincoln in the Kitchen by Rae Katherine Eighmey. March 2018 - Irish food made from whatever source you wish. The club took a break for the summer and fall. Please let the library know if you are interested in joining this group! If you like to play games and would like to meet others that like to play games, we hope you'll consider joining one of our game clubs. 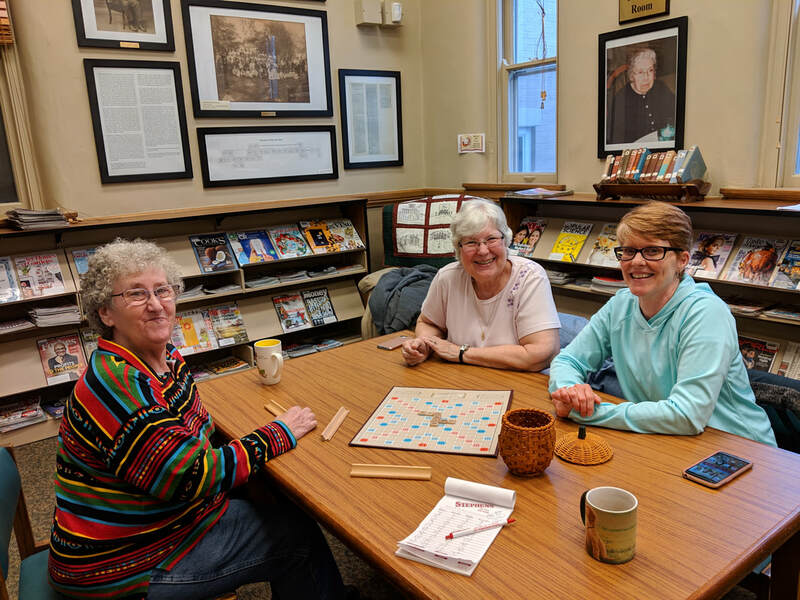 The library sees this venture as an informal group of people that get together to play games. The library will provide simple snacks and drinks and a few games. We have split the game club idea into 2 groups. We hope to have a Family Game Club. This club will be for families, or adults who like playing games in a family-type environment. There was not enough interest expressed so at this time we are not offering this group. We call our Game Club for Adults, Lost Marbles. This club will be for those who wish to play wholesome games with other adult, in a friendly non-competitive environment. The first meeting for this game club was on Friday, January 11th at 1 pm. We played Scrabble. We will meet on the first Friday of each month at 1 pm. Let us know if you would like to attend. Summer Reading - Every summer the library has a summer reading program for adults as well as children. Volunteering Your Time? If you would like to help the library, think of joining the Friends of the El Paso District Library!